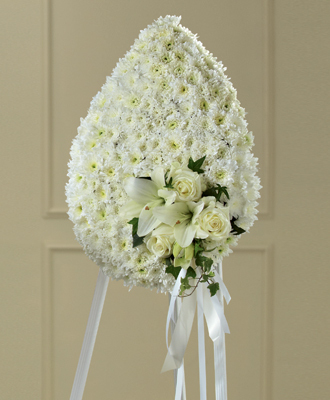 You can be sure that this exquisite expression of sympathy, crafted in the white of heavenly hope, will make a moving and impressive addition to a wake, funeral or burial service. Reflecting the form of a ?teardrop,? this generously scaled spray constructed by a local artisan florist includes white pompons, roses and Asiatic lilies accented with a white satin ribbon bow. It comes on a metal stand to give it the ultimate flexibility for display at a funeral home, in a church or at a cemetery. Product is not appropriate to send to a residence.